(CNN) -- It certainly isn't your average help wanted ad. A publication in Denver, Colorado, is looking for a journalist to review marijuana dispensaries. 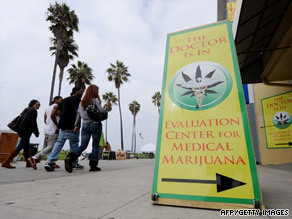 "Do you have a medical condition that necessitates marijuana? Do you have a way with words? If so, Westword wants you to join the ranks as our freelance marijuana-dispensary reviewer." The local "burgeoning medical marijuana scene" in Denver, Colorado, is growing and the weekly publication Westword wants to be on the forefront, said Joe Tone, the paper's Web editor. "We want someone who can get in and relay to our readers what it is like inside these dispensaries." It's not exactly like a food critic job. The online-only reviewer won't be showing up anonymously and sampling the wares. "They are to review the places, not the weed," Tone said. "We can't have our reviewer be stoned all the time," he quipped. But, he said, the ideal applicant should have "the ability to write and be in the position of holding a state medical marijuana card." The reviewer, he said, should know his or her way around dispensaries and be "passionate about the issue of medical marijuana." Colorado is one of 14 states where medical marijuana is legal by state law -- federal law still bans its use. But this week, the Obama administration announced a new policy loosening the rules regarding prosecuting criminal activity associated with medical marijuana. The Justice Department now says that prosecutors can go after traffickers but not medical marijuana patients and their caregivers. Though Westword is no longer accepting applicants for its dispensary reviewer position, they are actively working through the 120 they received and have culled the list down to under 20. The applicants run the gamut of 20-something stoners to well-educated engineers in their 50s. Some have even offered to work for free, Tone said, adding "We won't accept that." The pay is "meager," he said, but it's legitimate.